Joint Task Force (JTF)-GTMO policy is to avert death from hunger strikes and from failure to drink as well as to monitor the health status of detainees who are fasting voluntarily. Every attempt will be made to allow detainees to remain autonomous up to the point where failure to eat or drink might threaten their life or health. The Detention Hospital (DH) is responsible for providing health care monitoring and medical assistance as clinically indicated for detainees who are voluntarily fasting or on a hunger strike. The Officer in Charge (OIC) of the DH will ensure that the appropriate standards of care for the medical and administrative management of fasting detainees are adhered to. The DH OIC will do everything within his/her mean to monitor and protect the health and welfare of hunger striking detainees including involuntary intravenous hydration and/or enteral tube feeding if necessary. DH medical personnel will make every effort to obtain consent from a voluntary faster for treatment. What’s the distinction between a voluntary faster and a hunger striker? Voluntary total fasting (VTF) “occurs when a detainee communicates his intent to JTF-GTMO personnel to undergo a period of fasting for a specific purpose and has not taken any solids or liquids for a period of more than 48 hours. The JTF GTMO Surgeon, along with the DH medical staff the Commander Joint Detention Group (JDG), and the Commander, Joint Intelligence Group (JIG), in order to make a “hunger striker” designation, must prove intent, purpose and behavior, according to JTF GTMO. Religious fasting, severe depression with suicidal intent manifested by not eating or drinking are two examples where a detainee would not be designated a hunger striker but rather a voluntary faster or voluntary total faster. The designations, which appear in some of the released Guantanamo Files, all appear designed to lower the number of people who can be considered as people who are resisting authority. It appears to be a divide-and-conquer strategy. By deciding from the top that which detainees were part of a hunger strike, it gives them the ability to lower the detainees’ fortitude and courage in keeping a strike going in the prison. The JTF-GTMO Surgeon is only to remove “a detainee from the Hunger Striker list. Detainees are not to be removed from the list until a “DH medical officer has evaluated him and has determined that he is no longer on a VF, VTF or hunger strike.” This clearly demonstrates the prison staff has aimed to assert top-down authority by deciding who is and who is not striking. Detainees who claim to be striking will have to be approved for a list in order to strike. Thus, it appears some detainees could be refused the “right” to engage in a hunger strike. But, as noted in the cited release, military commanders consider hunger striking to be a tactic that “al Qaeda recruits” are encouraged to use to “attract media attention to their detention.” So, should one actually believe commanders who assert force-feeding or involuntary feeding of detainees has not been the military prison’s way of stifling resistance from detainees, who seek to assert themselves and gain rights in the prison along with greater access to legal counsel? All of the above details on Aamer’s hunger striking can be found under the line, “Detainee has continued to participate in activities against the US,” indicating hunger strikes are a kind of militant tactic to the staff. Abd Al Khaliq Ahmed Salih Al Baydani [ISN:553] allegedly wrote in a letter to Bader Al Bakri Al Samiri [ISN:274] that Al Samiri’s “hunger striking and violent fights with the guards” were “wonderful.” An analyst notes the detainee addressed the letter to Al Samiri’s “Paternal Uncle,” which means the letter likely went to Al Samiri’s relatives in Saudi Arabia. Whether it came back to the prison from a relative for Al Samiri to read is unclear. Looking at the reports, it appears many of the detainees that engaged in hunger strikes have one thing in common: they were labeled a “HIGH threat from a detention perspective” in their reports. It is also worth noting that sometimes the detainee reports mention hunger striking under the “Health” section. 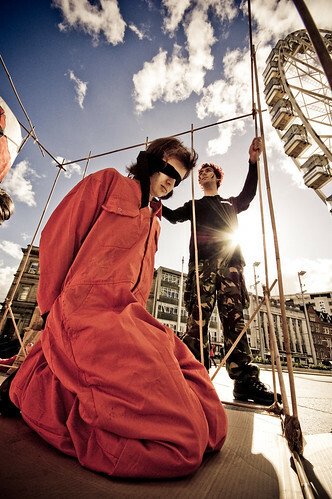 Sometimes it is mentioned under the “Detainee’s Conduct” section, indicating that hunger striking has been considered a disciplinary problem. And, in some cases, detainees that were known to have engaged in hunger striking had no details on their prison resistance recorded in their report at all. For example, Abdul Rahman Shalabi, who the Associated Press reported in 2010 was now Guantanamo’s longest-term hunger striker, had been engaging in hunger striking in the months before the date of his detainee assessment report. By then, he was being strapped down into a padded restraint chair and then force-fed with a flexible feeding tube that was inserted through his nose and throat. Yet, while he is listed as a “HIGH” threat from a detention perspective, there are no details on his engagement in hunger striking and in the “Health” section there is nothing on his hunger striking or his force-feeding. In March 2009, his weight had dropped to “107 pounds, 30 percent below his ideal body weight and at the threshold of major organ failure.” Dr. Emily Keram, a psychiatrist, concluded Shalabi exhibited symptoms and disorders that likely were a result of coercive interrogations and other mistreatment. And, she said records indicated he had been “subjected to Forced Cell Extraction in connection with his feeding multiple times per day through the months of January and February “ in 2009. -Zaid Muhammad Sa’ad Al Husayn [ISN:50]: In his report filed on December 5, 2005, Al Husayn is described to be in good health and noted to have gone on hunger strike in August 2005. -Mubarak Hussain Bin Abul Hashem [ISN:151]:In his report filed on March 25, 2005, under the “Health” section, it is mentioned that Hashem went on a hunger strike on time. Abdullah Kamel Abudallah Kamel [ISN-228]: In his report filed on December 27, 2005, Kamel is said to have a BMI on February 11, 2002, of 20%. It is noted he went on hunger strike in October 2002 and September 2005. If released without rehabilitation, close supervision, and means to successfully reintegrate into his society as a law-abiding citizen, it is assessed detainee would probably seek out prior associates and reengage in hostilities and extremist support activities at home and abroad. Since transfer to JTF-GTMO, detainee continues to demonstrate his commitment to extremist activities within the camp. Detainee volunteered to be a suicide operative and actively participates in the hunger strikes. Detainee has been mostly non-compliant with guard force personnel. He has responded cooperatively during debriefs in the past, but currently withholds information of intelligence value. -Abdul Rahman Mohammed Hussein Khowlan [ISN:513]: In his report filed on March 31, 2006, Khowlan is said to be a "former hunger striker." -Mamdouh Ahmed Habib [ISN:661]: In his report filed on August 6, 2004, it is noted that Habib has "a history of depression and behavioral disorders, benign prostatic hypertrophy, hunger striking, and had a knee surgery performed." -Emad Abdallah Hassan [ISN:680]: In his report filed on October 31, 2008, it is described in the “Health” section that he is a "high-risk detainee" from a health perspective. He is "a repeated hunger striker with subsequent complications and has a history of chronic pancreatitis for which he is receiving medication." -Muhammad Abdallah Taha Moaten [ISN:684]: In his report filed on April 16, 2008, Moaten is described in the “Health” section as a “high-risk detainee” from a health perspective. He has “major depression.” He has a “history of a Hunger Strike.” It is noted that “behavioral health” is following him. -Allah Muhammed Saleem [ISN:716]: In his report filed on July 2, 2004, under he is noted to have been a hunger striker in the “Health” section. -Bisher al-Rawi [ISN:906]: In his report filed on October 19, 2005, under “Health,” the reports indicate no “ongoing medical conditions” and that “he went on a hunger strike in August and September 2005.”. Mohabet Khan [ISN:909]: In his report filed on June 7, 2005, Khan is noted to have over the past six months failed to return to the bay when asked, saluted another detainee, engaged in a short-lived hunger strike (one day on March 2, 2005), and said to have been found “unresponsive breathing with his eyes open.” He also is noted to have asked to be moved because he was not getting along with other detainees. For the latest on the hunger strikes at Guantanamo, follow the reporting of Jason Leopold at Truthout or the work of Andy Worthington.